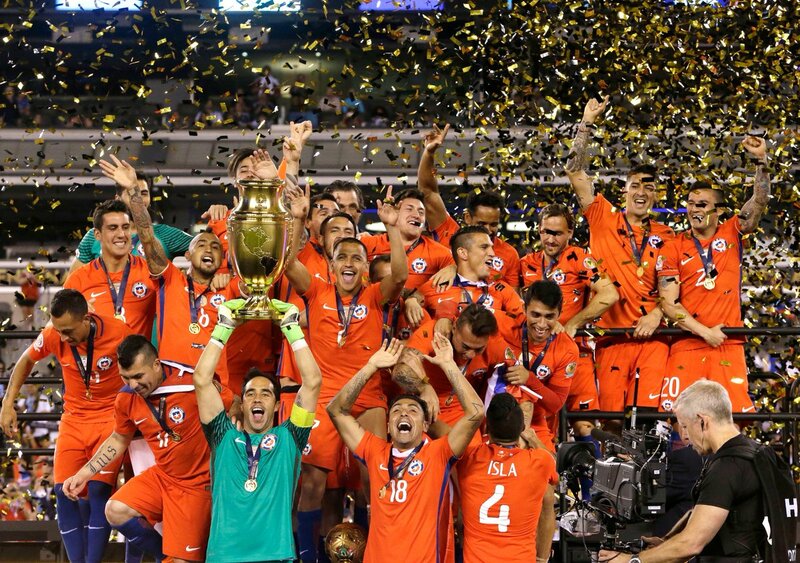 After a physical encounter in New Jersey, Chile once again trumped Argentina to capture the coveted Copa America crown. In a repeat of the final from a year ago, captain and national treasure Lionel Messi was looking to lead La Albiceleste to their first major silverware for 23 years against a Chile side who had hammered Mexico 7-0 in the quarter finals before dispatching Colombia with a fine 2-0 win to book their place in the final. Argentina had won their last nine games, and on a hot run of form as Messi and co embarked on a mission to end a trophy drought that seemed everlasting. The MetLife stadium welcomed Argentine fans who had shown up in full force, while pockets of Chilean faithful filled up in the blazing hot afternoon warmth of New Jersey. The scene was set for a scintillating encounter. Physical is the word that sums up the opening fifteen minutes, a slow tempo game with both sides scrapping for the bigger foothold of the game. 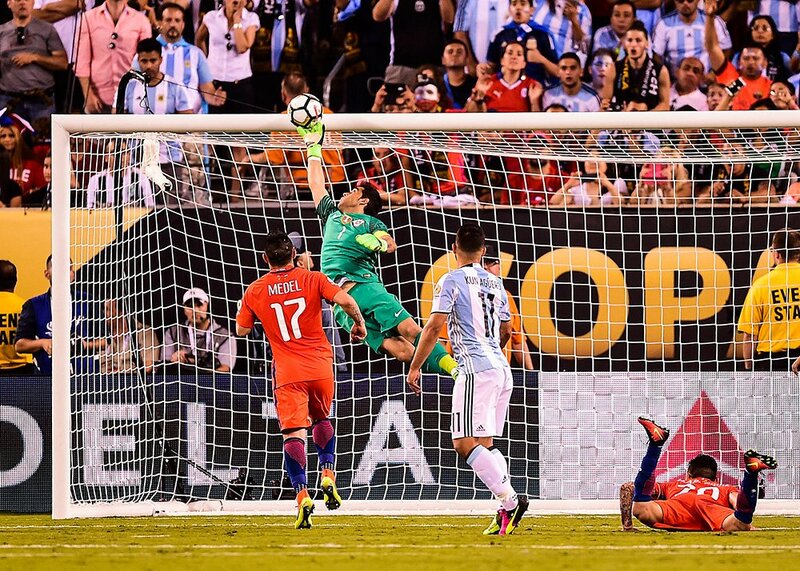 Chile's pressing game was not unnerving the 2014 World Cup finalists, and Messi had the first genuine sighter of goal in the seventeenth minute with a dipping free kick that arrowed towards the safe hands of club-mate Claudio Bravo. The reigning champions seemed to be overwhelmed by Argentina's attacking quality and moments later Gonzalo Higuain missed an absolute sitter. The Napoli forward galloped forward to capitalise on Gary Medel's poor awareness and skipped around Bravo, only to slice wide of the post. With 38 goals in 42 games for club last season, many would have banked on the 28-year-old to convert the opportunity. Drama kicked in as Chile's Marcelo Diaz picked up a second booking in extremely controversial circumstances. Tracking Messi's run, the midfield man appeared to turn and collide with the diminutive Argentine. It seemed really soft but Brazilian referee Heber Lopes thought otherwise and brandished a second yellow card to put Chile on the back foot. Alexis Sanchez - who appeared to be in considerable discomfort - and Arturo Vidal were not affecting the game anywhere near enough for Chile to pose a threat to Argentina's defensive lines. Limited to hoofing the ball forward in hope from free kicks, La Roja were yet to register a shot on target. Mere seconds before half time, the number of players on the pitch was reduced to 20, as Argentina evened the playing field with a dismissal of their own. Marcos Rojo tangled with Vidal as he surged forward, and the Bayern midfielder went down from the challenge from behind. Replays showed the defender made a fair attempt at winning the ball, but the referee was having none of it as tempers threatened to boil over in the New Jersey heat. Another harsh sending off tainted a wholly negative first period. Heber Lopes has shown 14 red cards in the last 27 games he's officiated in, including two already tonight. After seeing every passing lane blocked off in the first half, Chile looked comfortable with the ball now that their disadvantage had been wiped out. It was Argentina who mustered the first opportunity after the restart though, as Higuain again found himself in a position to cause panic. Clearly though, his finishing was not quite up to scratch on this particular occasion as he swivelled and fired off target. Sergio Aguero came on as Higuain was hauled off by 'Tata' Martino, and was caught in the midst of the action instantly. Following some mazy dribbling from Messi, the Manchester City man was positioned to shoot - miles over. Into the last ten minutes, Eduardo Vargas thundered down the flank in a one-man counter attack before flashing a shot that stung the palms of Romero in the Argentina goal. It was the first time the shotstopper had really been called into action. With the clock ticking down, Messi fashioned yet another chance for Aguero with twinkle toed playmaking, but again the substitute blazed horrendously over. 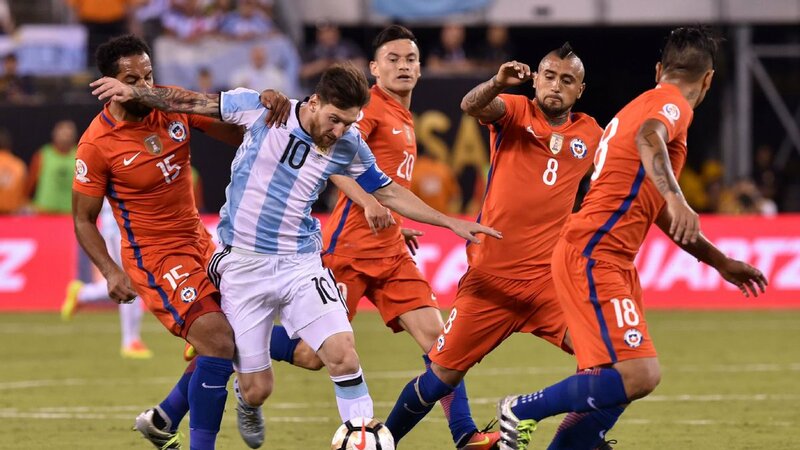 Composure seemed to have deserted the Argentine forwards on the big night. 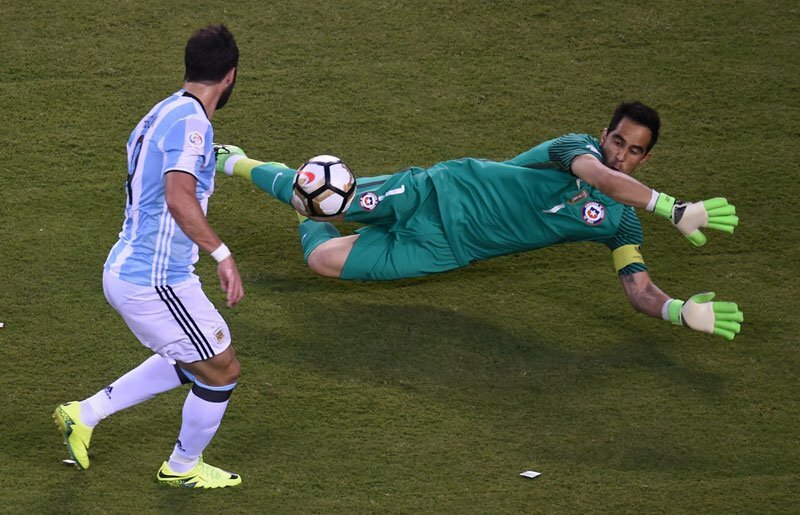 A final chance before extra time was wasted by Messi, as his mesmerising footwork resulted in a shot that flew wide of Bravo and the net. The players trudged back on for the additional 30 minutes of play, in search of delivering a killer blow to their opponents - and now seemingly their sworn eternal rivals. Bravo was forced into making a world-class save from Aguero's header in the 100th minute, as the blue and white majority of the stadium prepared to erupt in jubilation. The Barcelona 'keeper did outstandingly well to tip over a looping header at a crucial point in the match. With neither side being able to outsmart the goalkeepers, the game would ultimately be decided by penalty shoot-out for the second consecutive year between these two sides. The two marquee players for either side, Arturo Vidal and Lionel Messi, stepped up and missed their spot-kicks with bizarre finishes. Vidal failed to fool Romero with a tame effort while Messi blazed his penalty uncharacteristically off radar into the stands. Lucas Biglia was the unfortunate individual to miss the only other penalty, as Bravo saved well to his right. It all fell upon the shoulders of Fransisco Silva to secure his nation's second ever Copa title, and inflict heartbreak on Messi and Argentina, who have now lost three major finals in the past three years. Chile had grafted their way through a gruelling two hours of football, and Messi looked stunned as he trotted off the pitch away from the celebrations. 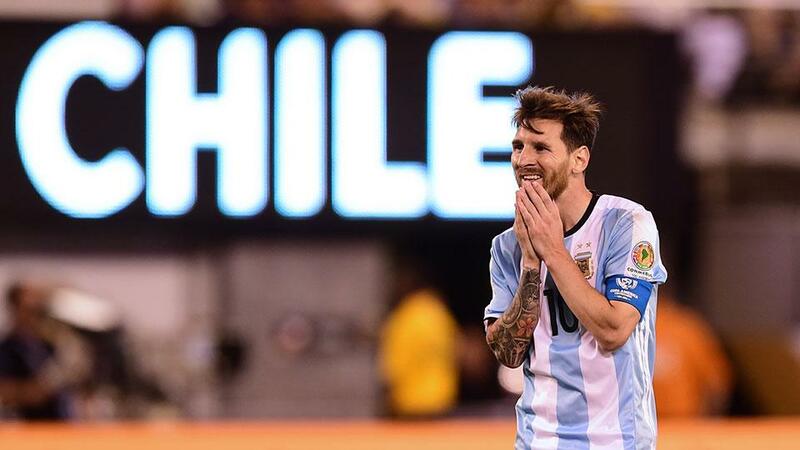 It's now 23 years and counting for Argentina's trophy drought, and one would think that one day, surely Messi can spark his country to glory again.